The Office- Every Sunday was Halloween. And then…..
Every family has unique rituals. Our`s is no different- except our rituals might be unusual compared to others. A long-established ritual for the Clampitts is the weekend trip to Spouse`s office. Spouse catches up on work while the Offspring catch up on homework, or Facebook. The well established custom begins with the Offspring lining up at the starting gate- the door between the garage and the entry. Once the door opens, they`re off. Racing down the vacant hallways fueled by desire for the candy placed at the secretaries` cubicles. Snorting and pounding their way through 4 floors of free candy, careening around corners and bouncing off each other toward the prize, they eventually return sweaty, exhausted and sugared up. Lest you think the Offspring are heathens living by their own rules, they were each allowed only one candy per cubicle. Every Sunday was Halloween at the office. In our parental quest to maintain some routine in our new home, the start of the school year was ushered in with the inaugural trip to Spouse`s office. Excited to sample the Japanese confections, the Offspring hit the hallways stampeding. Imagine their dismay-disbelief- to find one lone basket filled with a meager sampling. A pittance versus the usual cornucopia. Nary a chocolate in sight. I, undeterred, dove in with gusto. I emerged with a fist full of crackers. Not being picky, I didn`t pay close attention, or any, to the wrapper. I opened it, took a bite, and everyone started howling. “Mom- you STINK!” These Offspring have not yet mastered saying nothing if there`s nothing nice to say. In case I didn`t realize the full impact on their delicate senses, a very thorough dramatic scene ensued whereby their feelings were expressed through choking, gagging, and rolling around on the ground. The smell did illicit fond memories of a bait box left in the Galveston sun all afternoon and my Dad yelling at the wrong culprit. (Always funny) I flipped over the offending cracker to inspect more closely. Note to self- if there`s a shrimp on the label, not only is it shrimp flavored, it probably contains shrimp. One is even displayed demonstrating it`s authentic flavoring. Spouse picked nuts. He poured the bag in his hand. There were a few nuts in the packet. Spouse looked around the table and dumped the contents in his mouth. We all watched confounded as Spouse ate fish bait. He poured another fist full and started on his email. It`s now obvious to me why the Japanese are so much leaner than their Western counterparts. Instead of a heaping helping of Doritos with cheese queso, the snack choices are of the dried variety instead of the fried variety. 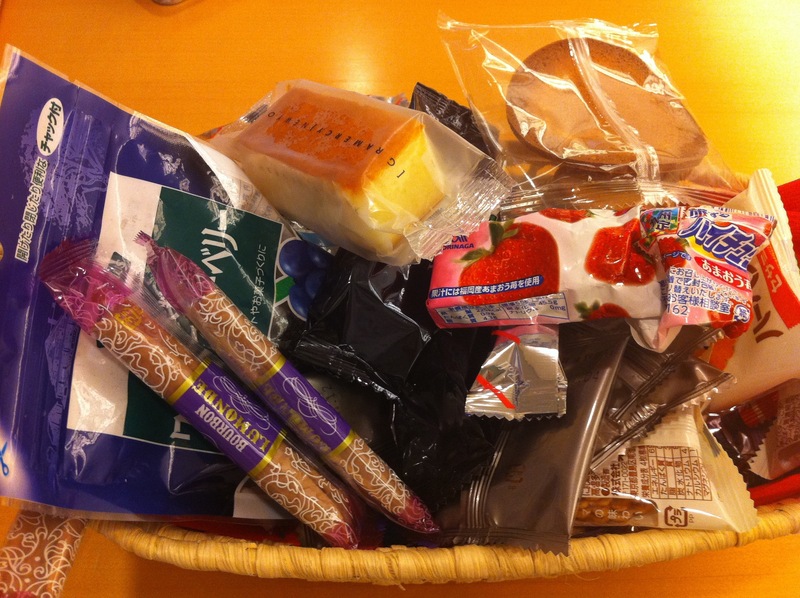 This entry was posted in Food, Moving to Japan and tagged Amblerangel, Culture, Emily Cannell, ExPat, food, Hey From Japan- Notes on Moving, Humor, Japan, Snacks, Travel. Bookmark the permalink. 25 Responses to The Office- Every Sunday was Halloween. And then…..
Dad and the bait box made me think of when The Tourist brought the dead crab she found on the beach to school for show and tell. The teacher was not impressed. Which makes me think of a more recent cultural lesson right here in Kentucky. My second grade daughter is studying Korea and wants to bring our friends’ son adopted from there to show and tell. We had our first lesson in Political Correctness. I’d be gagging, too. Holy bait box, Emily! I also love the Kentucky lesson in political correctness. Here in Lexington a citizen recently complained that the live Christmas tree in city hall was a “fire hazard.” So rather than cave to the pressure, our openly gay mayor moved the tree onto the roof of the building’s entrance. I guess bing gay in Kentucky teaches us one thing–if you can’t join ’em, beat ’em. Bless your neice’s heart. Her heart was in the right place I’m sure! That`s so funny Kathy! That mayor has moxie! Oh yuck, it’s definitely the eyes, lol 🙂 I can’t bring myself to eat anything that’s looking back at me! Best not to look I`ve learned. Then it all actually tastes pretty good. I actually got hungry seeing these pictures. When you grow up eating little dried fish and shrimp crackers for snacks, you don’t think there’s anything bad about the appearance, especially since the flavor is simply salty-crispy, not much different from potato chips. (Okay, there’s a little fish flavor in them, but really not much.) Eating Nacho-Flavored Doritos on the other hand make me physically sick, so it’s not just culture but stomach issues affecting my snack preferences. A better substitute for the term “political correctness” is respect for other people’s opinions, and knowing how to respond to them in a mature manner. 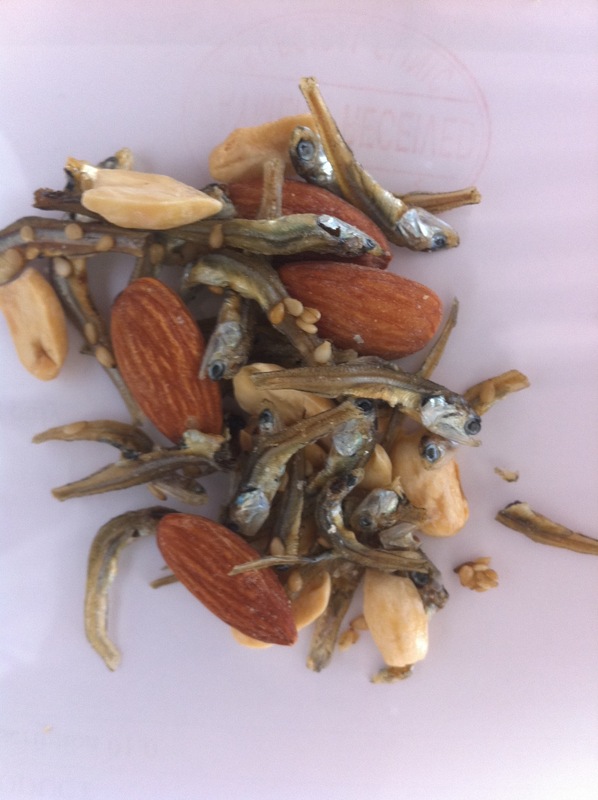 Now that I`ve gotten used to the concept of eating a whole dried fish (as opposed to just the body) they taste pretty good. Bottom line for me is that if it`s salty-I`ll probably like it. But you are so right- it`s what you`re used to. Kids here snack on cucumbers on a stick during festivals. And love them. In response of why they are lean and maybe not hypo I was travelling on.a plane sitting next to a Japanese mum with her two year old. Snack time was a tupperware container with steamed carrots, pumpkin and zuccini followed by cute little rice crackers! I have never sat beside a more engaging, bautifully mannered toddler in my entire life. Drink was water and it was a pleasure to be there in total opposition to the return trip with the kids from hell that everyone would have had pleasure in locking in the toilet or luggage compartment for the entire journey! Why can’t westerners stop feeding their kids junk? Not too sure about the dried fish in the snack pack but I guess you can get used to anything! Barbara- you are SO right. Kids get used to what they are fed. Here, water and green tea are the drinks of choice- for most ages. In fact, it`s the only country in the world where Coca Cola is not the number one drink- it`s water. Luckily I have adventurous eaters in my house so we`ve been able to adopt a few of the healthy habits learned here! Isn`t hard to live anywhere as a vegan? hahaha Do vegans eat tofu? There`s certainly a million different ways to do that! So true. I think I could get away with eating Indian food for the most part. There’s lots of veg options available. Well- tofu and salad are NEVER good at home. Why is that? With those kind of, um, treats lying around the office, I’d be able to fit into my skinny jeans again. I have an odd feeling that I might like that “mixed nuts”… Luckily I don’t have a sweet tooth, only a savoury one. 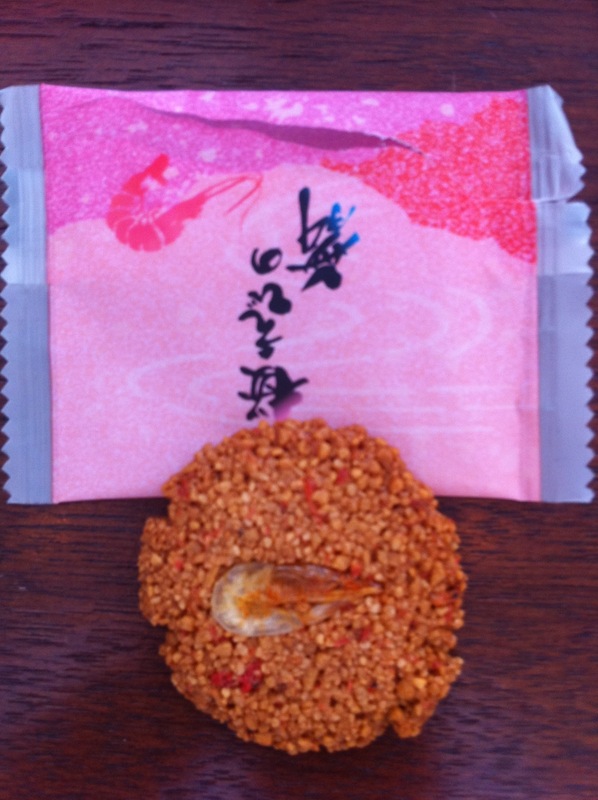 However, I’m not so convinced about the dried shrimp cookie! Dried with the head on…not so much…EWWW! Healthy snacks, great. 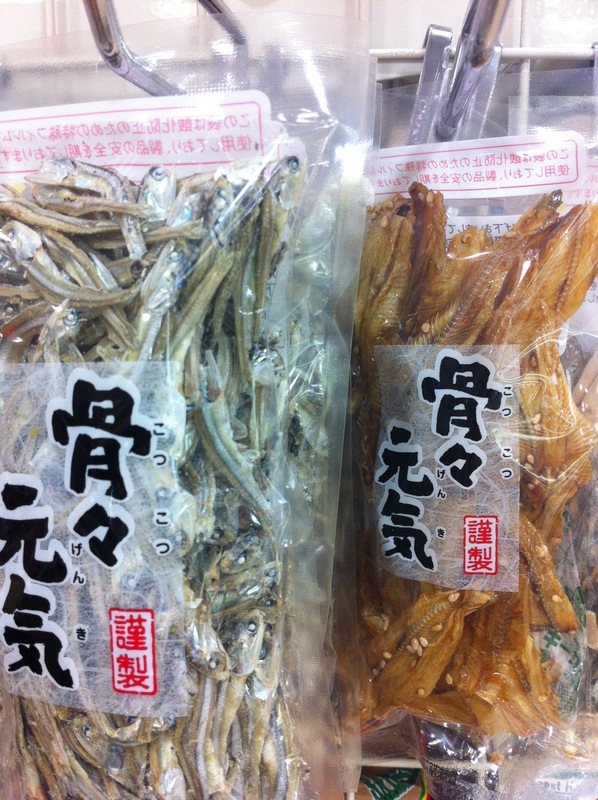 Dried fishy snacks, not so much! The smell would put me off – too much like Willie’s clothes after a day of fishing. The smell Is really hard- I also am used to that smell coming off bait! Ahhh- the beer nuts of the East! It really isn`t too bad. Especially after a couple of beers!